NEW YORK CITY— Global .gif phenomenon and Winner of the 2012 ‘Meme Of The Year’ Webby Award, NYAN CAT is the inspiration behind #NYANCATCITY: a good-humored, creatively diverse 4-day series of events that celebrates creativity and the influence of Internet culture—and cats. The fun begins with an Opening Reception on Thursday, December 13th at The Hole, a contemporary art gallery in New York City, and spreads over various locations such as Santos Party House, Lit Lounge and Yotel. Curated and produced by New York Art Department, #NYANCATCITY celebrates networked culture and encourages digital to analog interaction through a diverse program that includes panel discussions, in-store events, a benefit art auction, a zine fair, a themed brunch and multiple after-parties. 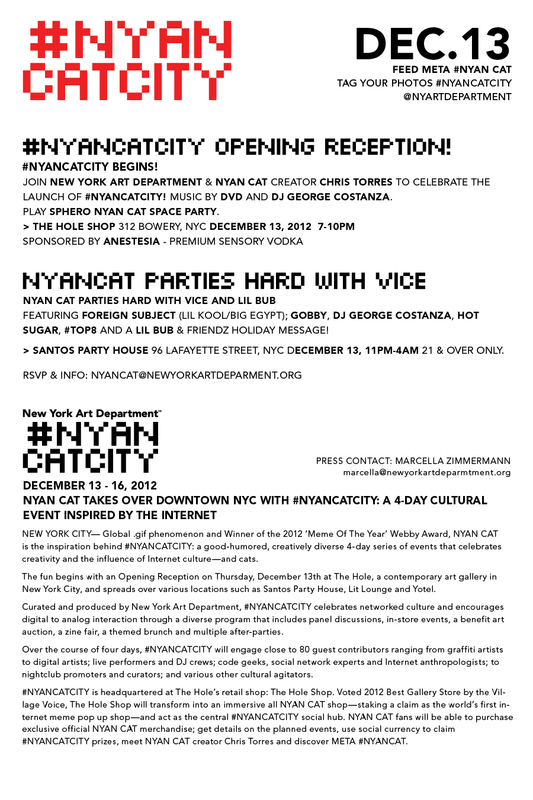 Over the course of four days, #NYANCATCITY will engage close to 80 guest contributors ranging from graffiti artists to digital artists; live performers and DJ crews; code geeks, social network experts and Internet anthropologists; to nightclub promoters and curators; and various other cultural agitators. #NYANCATCITY is headquartered at The Hole’s retail shop: The Hole Shop. Voted 2012 Best Gallery Store by the Village Voice, The Hole Shop will transform into an immersive all NYAN CAT shop—staking a claim as the world’s first internet meme pop up shop—and act as the central #NYANCATCITY social hub. NYAN CAT fans will be able to purchase exclusive official NYAN CAT merchandise; get details on the planned events, use social currency to claim #NYANCATCITY prizes, meet NYAN CAT creator Chris Torres and discover META #NYANCAT. WHAT’S IN THE CAT’S RAINBOW TRAIL? NYAN CAT’s success is powered by the energy of 100+ million fans. META #NYANCAT is, de facto, NYAN CAT looking in and sharing what makes it go: the fans and the #NYANCAT-tagged images they share on tumblr, Twitter and Instagram. Conceptualized for #NYANCATCITY by New York Art Department and developed in collaboration with UK-based wemakeawesomesh.it, META #NYANCAT not only aggregates and brings fans along a star lit 8-bit musical ride for all to see: It allows NYAN CAT to notice users whose images were prompted in the interactive rainbow trail and send personalized “Thank You”tweets the fans that posted them. At times, fans may even be rewarded with special gifts. New York Art Department and AOL worked together to raise funding for the digitization of Printed Matter’s archive. Hurricane Sandy flooded Printed Matter’s basement, destroying thousands of books and severely damaging archives dating back to 1978. Although the damaged collection has been freeze-dried as a temporary solution, the archive must be digitized for future generation’s enjoyment. 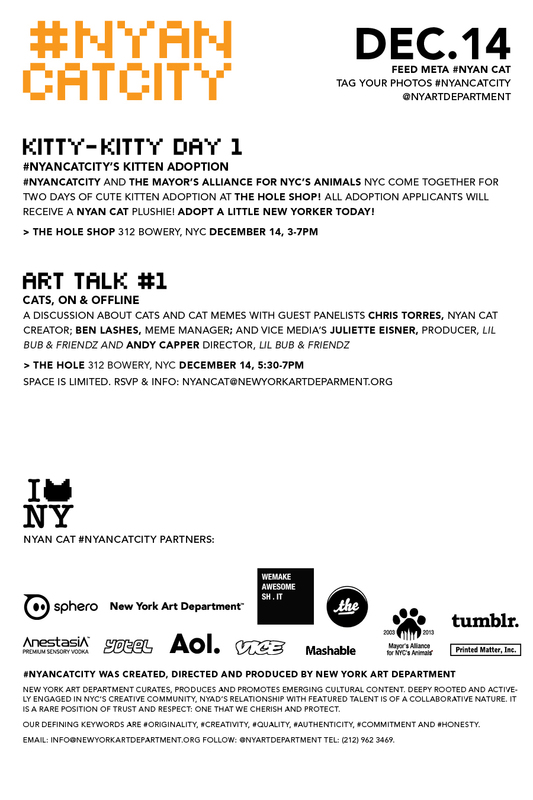 For one day, on December 14, 2012, New York Art Department curated a zine fair and group exhibition of Nyan Cat-inspired artworks, all raffled off at The Hole, as part of #NYANCATCITY’s cultural programming.